According to the majority, the North Face Ultra 109 GTX is a pair of highly comfortable shoes. Several runners mentioned that the shoe provided the needed level of protection underfoot to run over rocks and similar risky terrains. Many users lauded the enhanced breathability of the shoe which kept both the user’s feet and the shoe dry throughout the running sessions. Some users were of the opinion that the footwear had a rugged build. A few customers appreciated the traction of the footwear over tricky slopes and rocky trails. A number of users agreed that the shoe runs true-to-size. The Ultra 109 GTX is an affordable waterproof running shoe. Many customers had issues with the durability of the shoe’s upper; apparently, it started to tear at different places after only a few miles of running. For a runner, the outsole started to wear off after only a few days of use. One of the users commented that the right shoe behaved very poorly as compared to the left one in terms of waterproofing; the fabric allowed water to seep through. The North Face Ultra 109 GTX offers a great blend of toughness and flexibility. This stability trail running shoe performs very well on wet or tricky surfaces and keeps the user’s interest engaged in running owing to its excellent all-around features. For its future versions, however, it is recommended that the shoe does a bit more work on its design in terms of the long-term durability. 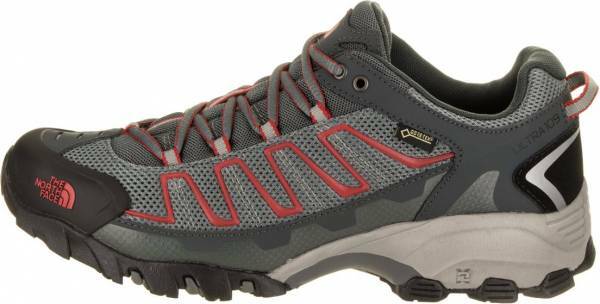 We love this shoe for its hiking ability, which at times feels almost as burly and tough as some mid-cut boots. It's a perfect choice for day hiking rough trails, wandering around mountain trails with a daypack, or even short backpacking trips. The North Face Ultra 109 with GORE-TEX® technology features several interesting technologies in its design for delivering an optimal combination of performance and comfort. The UltrATACTM rubber outsole is very resistant to abrasion and also being highly durable, exhibits excellent performance throughout the lifecycle of the shoe. The shoe also uses the notable Gore-Tex membrane that makes the shoe waterproof. It is very efficient in keeping the shoe dry and warm even on wet running conditions. Although conventional, the compression-molded EVA (Ethyl Vinyl Acetate) midsole results in the most durable, springy and comfortable form of cushioning for the user. This works in association with the ESS midfoot shank for an optimal combination of stability and flexibility under the arch region. The PU-coated leather upper, along with the TPU toe cap, delivers high protection, enhanced flexibility and maximum comfortability to the user. The performance of the North Face Ultra 109 GTX is enhanced even further with the help of GORE-TEX® Extended Comfort Range technology in the midsole, which provides a remarkable service in terms of waterproofing. The North Face Ultra 109 GTX, a stability trail running shoe, comes in the standard running length and is available in standard medium width of D for men. The shoe offers a medium fit in the forefoot, midfoot and heel areas. The shoe utilizes the UltrATACTM rubber on its outsole for maximum traction and resistance to abrasion. The material is durable, so it enables the shoe to withstand harsh trail conditions and perform well for a long period of time. The lug patterns of the outsole aim to provide runners with the reliable grip needed on varied trail surfaces. The lugs are aggressive enough to survive uphill and downhill runs. In its midsole, the North Face Ultra 109 GTX utilizes the compression-molded EVA (Ethyl Vinyl Acetate) midsole. The material provides the ‘bouncy’ feel to the user while running and enhances comfort underfoot. The midsole foam aims to deliver consistent cushioning for the entire duration of the running activity. The ESS midfoot shank provides stiffness in the middle portion of the shoe under the arch to make the shoe more resistant to torsion. The TPU Snake PlateTM provides additional protection underfoot and reduces the risk of injury for the runner from aberrations. This TPU plate is lightweight and remains to be flexible. The North Face Ultra 109 GTX features the PU-coated (polyurethane-coated) leather on its upper for maximum protection and longer lifespan of the shoe. This GTX running shoe offers an effective shield to keep the foot dry throughout the run. The shoe houses the GORE-TEX® Extended Comfort Range, a highly breathable waterproof membrane, for enhanced protection against moisture and keeping the user’s feet comfortably dry and cool while out on the trails. The protective TPU toe cap results in the additional protection against the impact forces, keeping the foot free from injury. It also adds to the durability of the shoe. The lace-up closure helps in maintaining a snug fit for the user throughout the running session.